Here is a package of 8 absorbent coasters made of compressed cardboard. These coasters are biodegradable and are made in the USA. Each coaster is 4" square. These coasters absorb small spills and water drops from drink condensation. 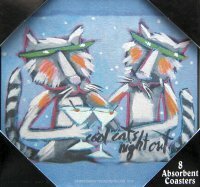 Design appears on both sides of the coaster.